Before the legal brawls, there were backyard boxing matches. Cross-posted from Kochology, where Daniel Schulman is releasing exclusive documents and other materials gathered in the process of reporting his new book Sons of Wichita: How the Koch Brothers Became America’s Most Powerful and Private Dynasty. Sons of Wichita hit bookstores on Tuesday. The early reviews have been great. Vanity Fair calls Sons of Wichita “never less than engrossing” and “a stylishly written saga.” The American Prospect says “despite Schulman’s often-superb eye for the revealing and/or juicy detail…he never stoops to caricaturing his subjects as the Koch Ness Monsters of popular lore.” Earlier this week, Mother Jones published an excerpt from the book that delved into the long battle between the Koch brothers, which played out in a series of scorched-earth lawsuits that earned untold millions for a small army of lawyers and private eyes. 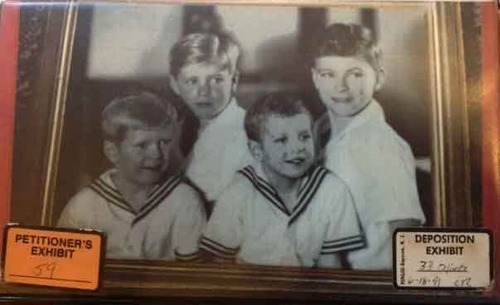 The clip above, circa the 1940s, shows a more good natured (even endearing) bout between David and Bill as young boys. It was included in a compilation of family footage that was submitted as evidence in the 1991 legal battle over the Koch matriarch’s will. The feud between her sons had devastated Mary Koch. In a last ditch bid to end the legal skirmishes, she included a clause in her will stating that if any of her sons were engaged in litigation against each other at the time of her death, they would be cut out of her estate unless they dropped the lawsuit. This clause was aimed squarely at Bill and Frederick, who in 1985 had filed suit against their brothers and Koch Industries, claiming they had been misled about the true value of the company when Charles and David bought them out in 1983. Bill and Frederick had no intention of dropping their suit. Following Mary’s December 1990 death they unsuccessfully contested her will, alleging that Charles and Koch family lawyer Bob Howard (whose firm both drafted Mary’s will and represented Charles and David in the 1985 lawsuit brought by their brothers) had unduly influenced her to insert the disinheritance clause. Not long before her death, Mary gave copies of the tape, which she had compiled from old family footage and partially narrated, to her four sons. At trial, it was used to show that she was not of diminished capacity when she decided to revise her will to add the disinheritance clause. She hoped it would stop the war. But it only ignited another battle.